This recipe is not complex or fancy. It is simply one of the great comfort foods of my life. Nanny would make it when my sisters and I came with her to the cabin in the summers. 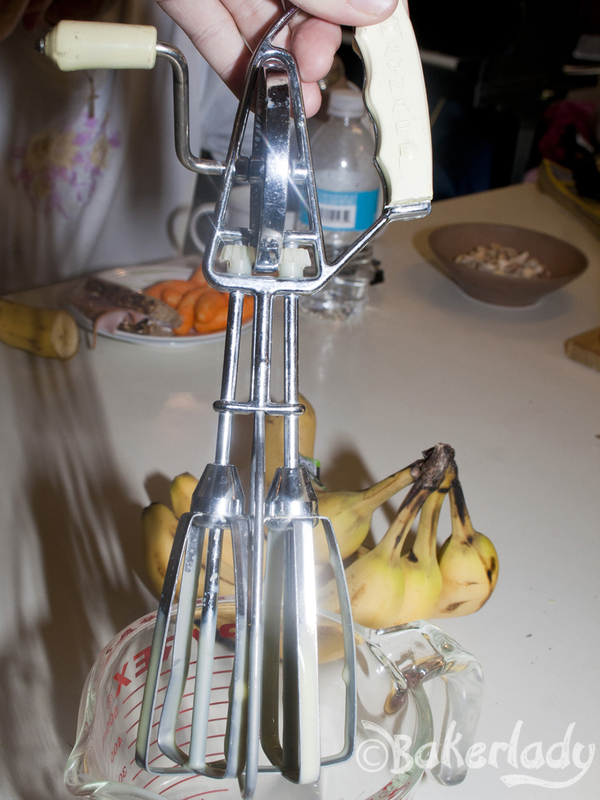 We got to layer the bananas and the cookies, whisk the pudding and generally feel incredibly useful. Last weekend my sisters and I went to the cabin again with Nanny, and the fact that our parents weren’t coming with us immediately compelled us to purchase the ingredients to make Nanny’s Banana Pudding. We started by busting out the very old hand-held whisk. The most awesome thing ever. It still works! Just a few minutes later and the pudding was perfect. You can make your own vanilla pudding if you’d like, but Jell-o was always the way Nanny did it, and that’s plenty good enough for me. 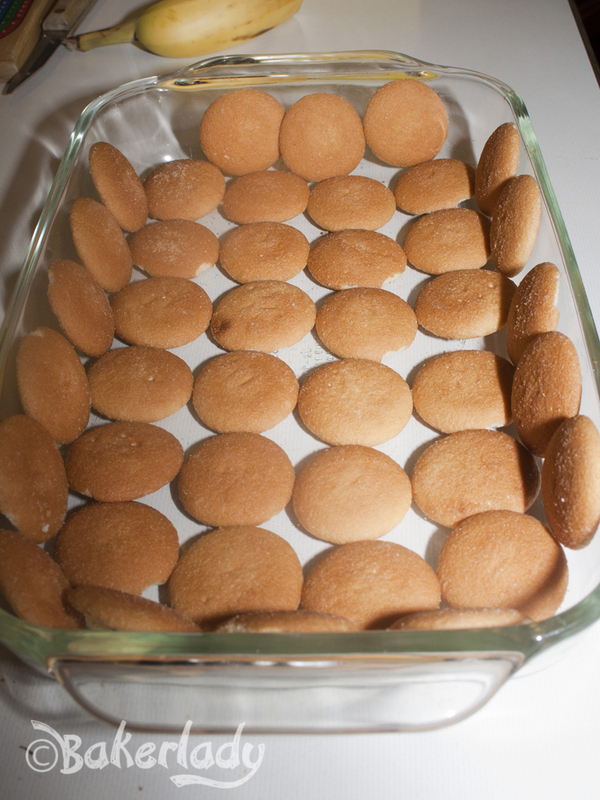 Layer up some Nilla wafers in whatever casserole dish you can find. We had to look deep in the recesses of the cabin’s cupboards before finding one that would fit all this deliciousness. We did find 7 pie plates though. Funny, Nanny didn’t remember ever making enough pies to warrant a stash of dishes like that. Dump half the pudding over the cookies and smooth it out. You can just make out the cribbage board in the top left of this shot. Also essential for camping at the cabin with Nanny. We are cribbage playing fools. 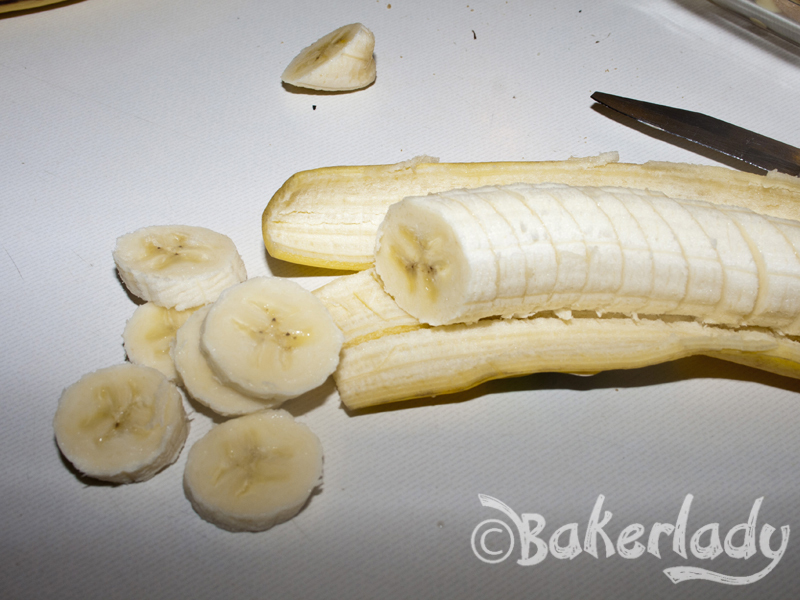 Then cut up some bananas. Preferably with a dull knife, missing the tip. It’s more authentically Nanny that way. And layer them on top. 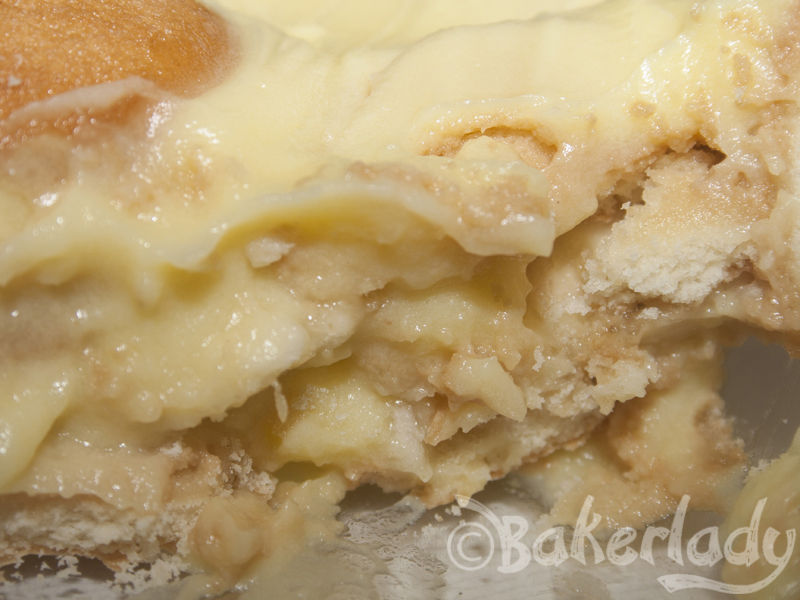 Then repeat the cookies/pudding layers. Now, as we were spooning the final bit of pudding over the top, we realized it’s possible there should have been another layer of bananas in there somewhere. At that point it was too late for us to fix the situation. And, we’d had enough wine that we didn’t really care. I think Nanny always did just one layer of bananas, but another one wouldn’t hurt I suppose. As we were garnishing the top with a few cookies, my Nanny informed my uncles (who’d come up for the day) what we’d just made. I’ve never seen them get so excited, and we’re a family who is generally pretty thrilled about food. Apparently Nanny used to make this pudding for them as a reward and when they were sick at home. It is pretty much their favorite dessert ever. It’s incredible the effect nostalgia has. This pudding is a family tradition that I’ll never grow tired of. My two uncles and I polished off half the dish when we came into the cabin to get the pudding out for everyone else. Yeah, see how we worked that? It took all of my self-control to leave some for the rest of the gang. Every bite is perfection. 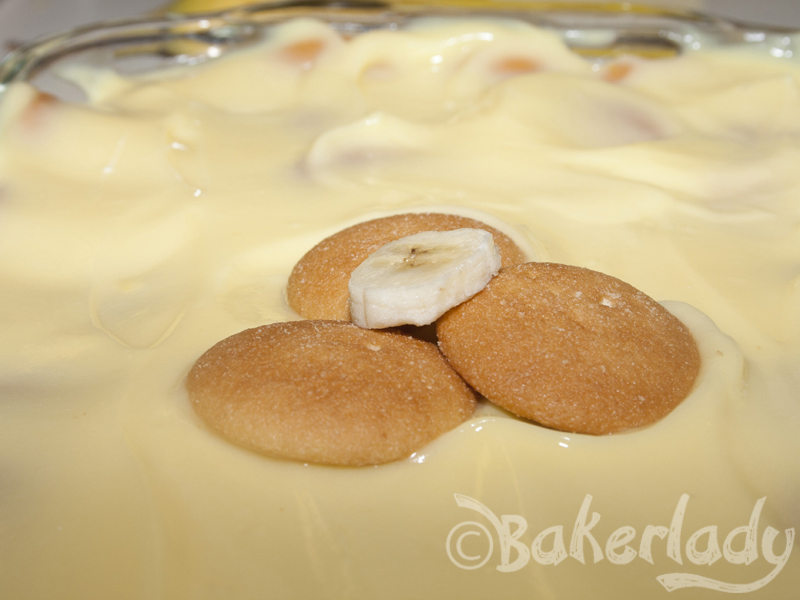 Cool creamy pudding, sweet bananas and slightly softened cookies exquisitely layered in every mouthful. This is the best pic I can give you of the inside layers. If I’d spent any more time on it, my uncles would have taken down the whole tray. Yum yum yum. Thanks Nanny. I love you. 1. 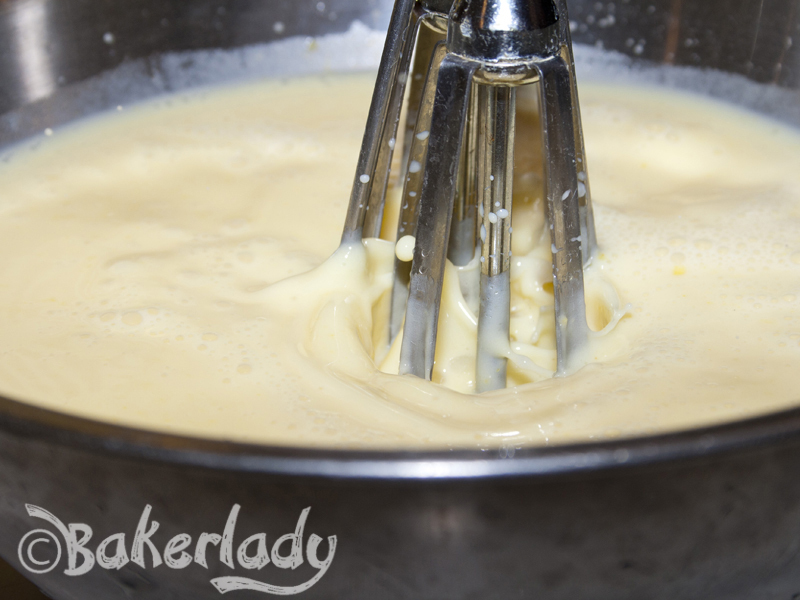 Beat milk and pudding mix with whisk (or a really old hand blender) for 2 minutes. Let stand 5 minutes until soft set. 2. Meanwhile, layer Nilla wafers in an even layer in a 9×13 (or whatever dish Nanny happens to have in the kitchen) casserole dish. Cover bottom completely and up the sides. 3. Spoon half the pudding over the cookies and smooth. 4. 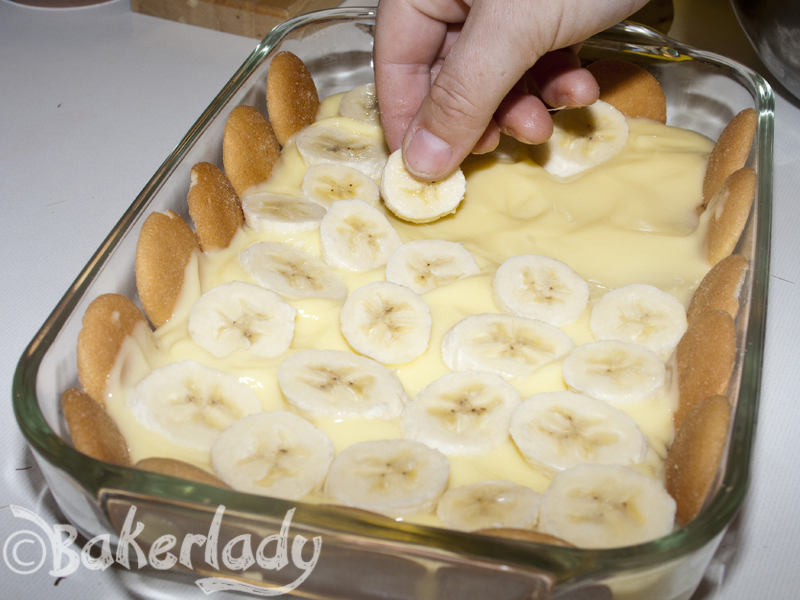 Layer bananas in an even layer on top of the pudding. 5. 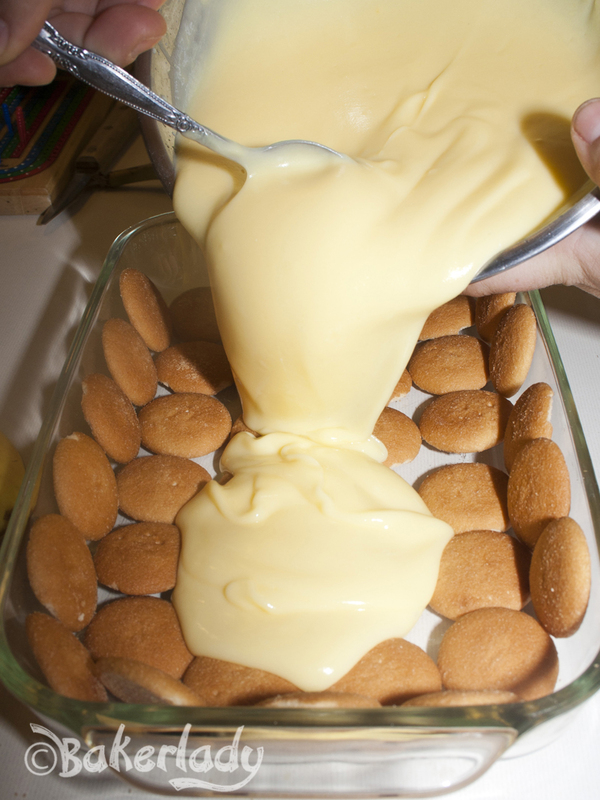 Cover with more Nilla wafers and then the remaining pudding. 6. Garnish with a few more Nilla wafers if desired. thank you,I had forgotten how to make this tasty dessert. This is exactly how my mom always made it, wondeful memories. Thanks for sharing. Sue, you’re very welcome. I love food memories. Imagine my daughter also taught my grandaughter who is married now with kids of her own. 5 generations. Put an 8 oz package of cream cheese to that..very good. How wonderful that you can make memories with your grandkids. I cherish every moment with my Nanny. She’s an incredibly special person. When I was a preteenager, I also made the above recipe except I used graham wafer squares. It was always a hit in our house, and I was proud that I could make dessert when I was 9 years old! 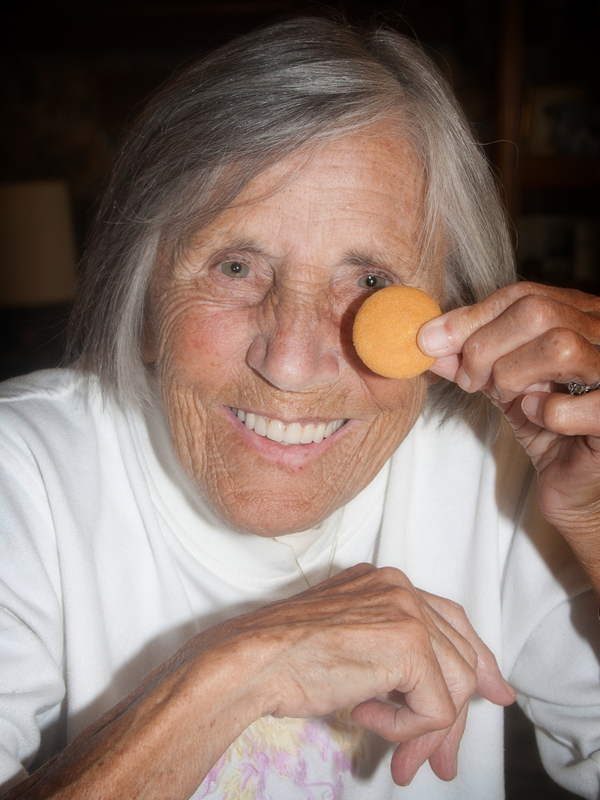 Mrs. G – Graham crackers were a great substitution, they are very similar. Glad your kids/grandkids loved it! I made this exactly how it said and not only did I not have enough pudding for two layers it was barely one layer. I’m sorry to hear that Dawn. Not sure what could have gone wrong. 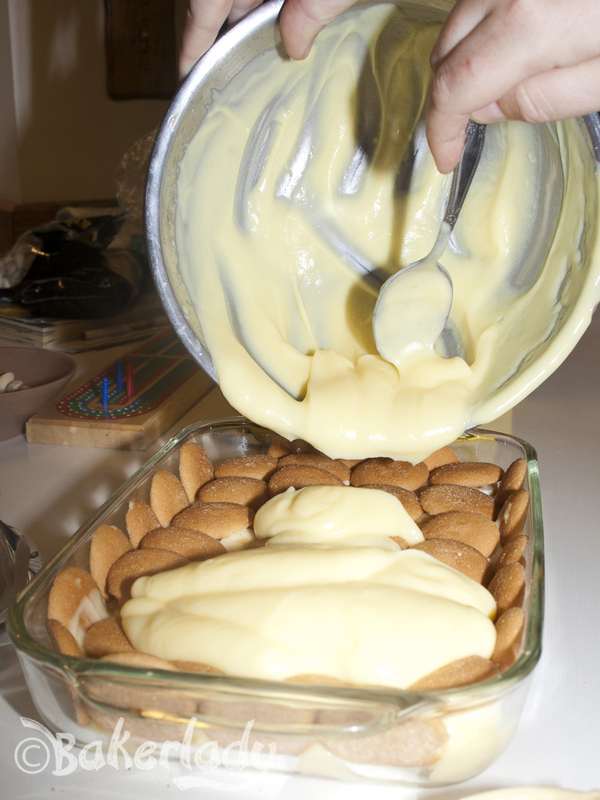 You want to be sure to only use half the pudding mixture for the first layer to ensure you have enough for the second. Maybe try using a smaller dish next time? This reminds me of my best friend’s grandmother because she would always make this for the family potlucks and my grandma used to make the same thing when I would stay the night at at her house. 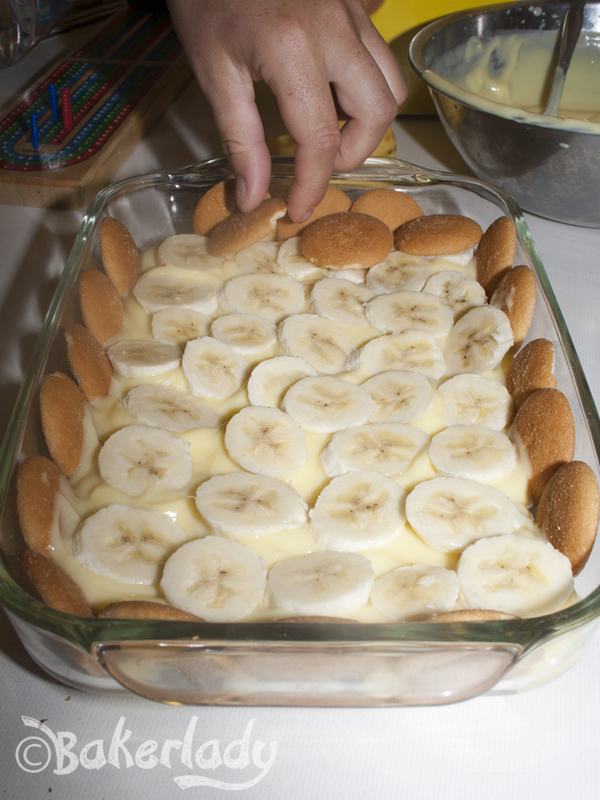 Banana Pudding equals Love! Thanks for sharing, it brought a smile to my face and now I can’t wait to make it again. Aren’t food memories associated with loved ones the best? !